Sweaty, sensual, and fun, Zumba is a great way to spend an evening exercising. Zumba trumps its more traditional calorie-burning competition, exemplifying the clichéd credo that exercise should be enjoyable, yet executes in a manner that is anything but clichéd. 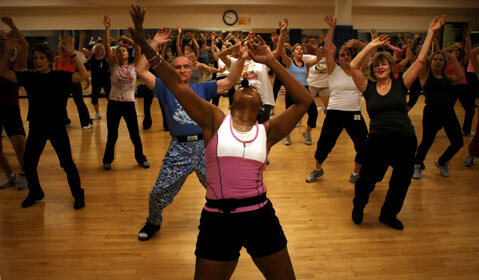 With its harmonious medley of various dance routines, Zumba is as worthwhile for its music as it is for its moves. Showcasing the likes of flamenco, merengue, salsa, hip-hop, swing, country, the cha-cha, and even a little bit of Elvis-inspired rock ’n’ roll, the exhilarating music serves as the perfect distraction to the—at least in my case—woefully sans-rhythm image in the mirror. Wonderfully enough, it is that marriage between such a wide array of dance styles and their musical counterparts that negates the mirror’s presence. The unpredictable transitioning from one style to the next—from slow, sultry hip swiveling to kick-up-your-heels honky-tonk—brings about a certain body awareness unmatched by many other exercise regimes. Requiring more focus on how the body moves than on how it looks while it moves, Zumba inadvertently allows participants to engage the mind and body equally. Once immersed in the movement, it can be all too easy to lose track of time, place … or where your feet are going. There to quell the spell is certified Zumba instructor Brandi Davis. A dancer all her life—and current Zumba extraordinaire at Spectrum’s uptown and downtown Santa Barbara clubs—Davis is happy the class has received a “really good response,” applauding the diversity of participants, apparently a steady swirl of various age groups, genders, and talents that run the gamut. Such rampant enthusiasm is hardly a Santa Barbara phenomenon, however. Zumba was conceived in the 1990s by celebrity trainer Beto Perez, who one day just happened to forget the music for his aerobics class and improvised, using his personal music collection, an apparent fusion of such aforementioned music genres. Thus, Zumba was born. Although an accident, Zumba was hardly a mistake. With more than five million participants per week at more than 40,000 locations in 75 countries, it could easily be said that Zumba has surpassed a formerly cult-like following for an ever-growing mainstream appreciation. The next Zumba basics class takes place Friday, February 5, from 4:30-5:15 p.m., at Spectrum Downtown (21 W. Carrillo St.); $20 for nonmembers. For more info, call 965-0999 or visit spectrumclubs.com/sbdowntown.